Florida Leads Insurance Sign-Ups, Despite Political Opposition To Overhaul : Shots - Health News With two weeks to go until the 2015 Obamacare enrollment deadline, Florida is ahead of even California, which has twice the population and embraced the Affordable Care Act from the start. Jose Ramirez and Mariana Silva speak in December with Yosmay Valdivia (right), an agent from Sunshine Life and Health Advisors, at the Mall of the Americas in Miami about plans available from the Affordable Care Act. When Florida workers promoting President Obama's health law marketplace want instant feedback on how they're doing, they go to an online "heat map." The map turns darker green where they've seen the most people and shows bright red dots for areas where enrollment is high. "The map shows us where the holes are" and which communities need to be targeted next, said Lynn Thorp, regional director of the Health Planning Council of Southwest Florida. She hands out information about the health law's marketplace at rodeos, farmers markets, hockey games and almost any place where people gather. 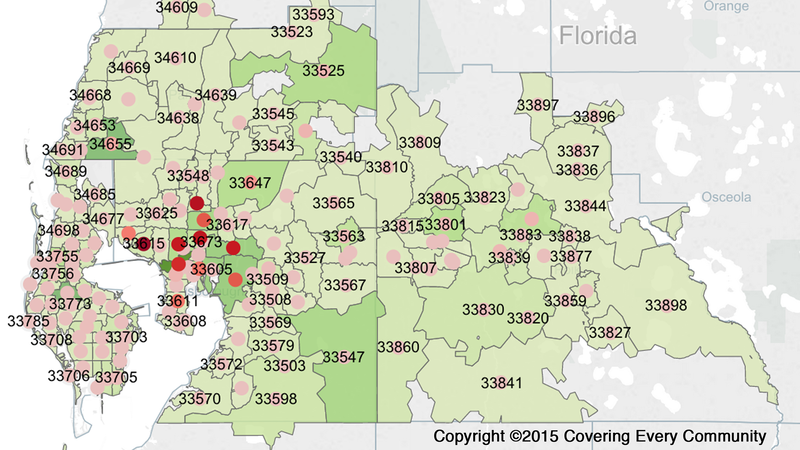 A heat map shows the outreach efforts around Tampa, Fla. The mapping strategy is one reason why a Republican-controlled state like Florida, whose leaders have criticized the health law at practically every turn, is leading the nation in signing people up for private Obamacare health plans. With two weeks to go until the deadline for 2015 enrollment, Florida's tally exceeds that of even Democrat-led California, which has twice the population, uses three times as much federal funding for outreach and has built its own online marketplace. "It's surprising Florida has done as well compared to other states, and they will be looked at by folks who want to learn lessons to promote enrollment," said Joel Ario, managing director for Manatt Health Solutions, a consulting firm, who worked for the administration setting up the exchanges soon after the law was passed. As of mid-January, 1.27 million Floridians had enrolled in exchange plans, according to federal data, compared with 1.2 million Californians. Texas, which has 6 million more people than Florida, enrolled about 919,000 people in private plans. Both Florida and have a 22 percent uninsured rate. California's rate is 17 percent, according to the latest census data. "It is truly ironic that Florida leads the nation in enrollment ... with leadership that has actively opposed the law," said Leah Barber-Heinz, executive director of Florida CHAIN, an advocacy group involved in outreach efforts. "It shows true commitment on the part of many and it portrays an extremely high need for affordable coverage. 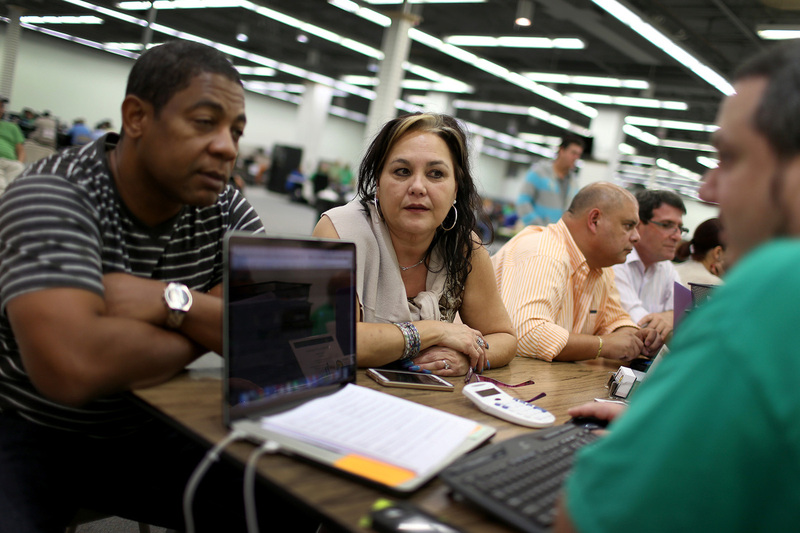 There are other reasons cited for Florida's robust enrollment —including intense competition among insurers in several big counties and the high degree of coordination among the nonprofits and community groups which received federal grants to sign people up. Another key factor is the state's decision not to expand Medicaid under the law. That's left consumers with incomes above the federal poverty level of $11,600 per year with no coverage option other than to buy a private plan — with help from sliding-scale government subsidies. About 800,000 Floridians who make less than the federal poverty level are shut out altogether because they make too little to qualify for subsidies for private plans, but too much to qualify for Medicaid. In Florida, adults with children qualify for Medicaid only if their income is below 34 percent of the poverty level. Childless adults are ineligible. Florida is one of 22 states that chose not to expand Medicaid after the U.S. Supreme Court made that provision optional for states. Covered California spokesman James Scullary said the exchange isn't allowed to enroll people in private plans if their incomes fall between 100 and 138 percent of the federal poverty line, because they qualify for Medicaid. Jon Urbanek, senior vice president of Florida Blue, the state's dominant insurer, credits Florida's strong enrollment in private plans, in part, to the state's decision not to expand Medicaid. He also points to the intense outreach by thousands of the carrier's insurance agents. Florida Blue has conducted about 3,000 "town-hall" style meetings at its 18 retail centers. "We knew going in that this was going to be a face-to-face, get in the community type of action to build trust with people," he said. Then there's the unusual effort to coordinate outreach. John Gilbert, national field director for Enroll America, a nonprofit doing outreach in 10 states, said Florida has benefitted from having several large nonprofits with experience signing up children for Medicaid. They have worked together closely – helped in part by the heat map. "We can then make sure we are appropriately allocating resources," said Melanie Hall, executive director of the Tampa-based Family Healthcare Foundation, which devised the mapping tool. Her group is working with the University of South Florida, which received a $5.4 million federal grant to help people anywhere in the state enroll. In all, Florida nonprofits received $6.8 million in federal "navigator" grants. Perhaps another, harder-to-measure factor is how advocates have been fired up by the opposition of many of the state's political leaders, said Barber-Heinz of Florida CHAIN. "Stakeholders that didn't work together in the past are working together on this," she said. "It drives us to work even harder."